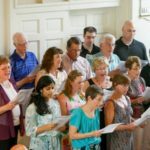 The Praise Ensemble leads congregation singing at the Contemporary worship service every Sunday. Singers and instrumentalists rehearse the day’s music just before the service begins. Contact Gabrielle Heath, Minister of Music, if you would like to join the group.